Lucie Cotterill entertained us and made us think about “Creating a Culture of Feedback” during her IATEFL presentation on Tuesday. 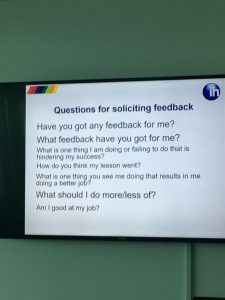 Through a number of thought-provoking techniques and a lot of laughter, we considered how people generally want to receive feedback, even if it is negative, about their professional performance, but that people generally find it very difficult to give negative feedback. Lucie shared strategies for creating a culture of feedback through designing opportunities to give and receive feedback, providing training to people who need to give feedback, establishing transparency on how feedback feeds into the organization and improves it, and encompassing a positive perception of feedback from both managers and teachers. She used a term, “radical candor,” and explained that if a person isn’t made aware of an issue now, later it could become a major issue. She left us thinking about how all feedback is a gift and that the response after receiving feedback should be “Thank you, tell me more” – all this while waving a pair of new white undies in the air. If you didn’t see it, you really missed a great session… .